The Gauchers Association is pleased to provide an update on the progress of a potential Gene Therapy targeting treatment for all types of Gaucher disease being undertaken by Professor Simon Waddington and Dr Ahad Rahim. We are delighted to announce that Apollo Therapeutics teamed up with Professor Simon Waddington and Dr Ahad Rahim in late 2017 to progress the pre-clinical work previously undertaken and reported in the Gauchers News. The UK Gauchers Association continue to be a valued and active member of this team to bring a potential treatment to Gaucher patients. Apollo Therapeutics provide committed translational funding and drug discovery expertise for novel therapeutics, sourced from the best of British academic research, accelerating them towards the clinic. The Gauchers Association gave a small grant to both Professor Waddington and Dr Rahim back in 2009 to purchase some viral vectors for use in gene therapy research thanks to the family of Ellie Carter who died from Type 2 Gaucher disease. The Association alongside Professor Waddington, Dr Rahim and Apollo Therapeutics will continue to keep our members updated on progress. 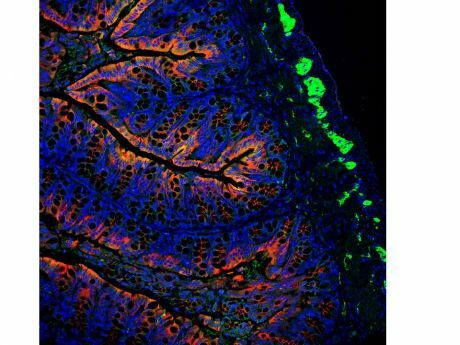 Researchers have successfully prevented the development of a fatal neurodegenerative disorder, Gaucher disease, using fetal gene therapy, in mice. Congratulations to Dr's Ahad Rahim, Simon Waddington & Giulia Massaro and all involved in this project. The Gauchers Association has been involved in this project since 2009 and remains involved to seek to bring a potential cure for nGD. Since our last brief update the Gauchers Association and Drs Simon Waddington and Ahad Rahim and their team at University College London (UCL), along with Dr Elin Haf Davies submitted an application to the European Commission for a 2020 Horizon bid to take our Gene Therapy forward into a clinical trial, entitled RightingGaucher. Horizon 2020 is a pot of money provided by the European Commission for research and innovation projects from 2014 – 2020 to produce world-class science, remove barriers to innovation and makes it easier for the public and private sectors to work together in delivering innovation. Unfortunately, we were not successful but have identified others avenues of funding which we intend to pursue. One of the key next steps for this work to continue is to work with the European Medicines Agency (EMA) to gain advice on the pre-clinical work we still need to undertake and on designing the clinical trial protocol. 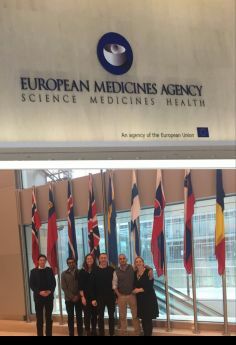 On 7th March the Gene Therapy Team (pictured below) supported by Dr Anupam Chakrapani & Dr Julien Baruteau, from Great Ormond Street Hospital attended a Scientific Advisory Working Party meeting at the EMA to discuss these issues. We anticipate feedback from the EMA in April. Over the last 7 years the Gauchers Association has been working with and has provided research funding to Drs Simon Waddington and Ahad Rahim and their team at University College London (UCL) to look at the potential of bringing Gene Therapy to the Gaucher community with a focus on Type 2 and Type 3 where there are huge unmet needs. In February 2015 the Association received Orphan Designation for Gene Therapy for Gaucher disease and we are delighted to report that we have successfully submitted our report to the European Medicines Agency (EMA) on the progress that we have made over the last 12 months and what our plans are going forward. The Gauchers Association continue to financially support Giulia Massaro, a PhD student for 3 years (2014 – 2017) through the UCL Impact scheme for a project focusing on investigating the efficacy and safety of minimally invasive intravenously administered gene therapy. In June’s edition of Gauchers News we reported that earlier this year the Association were awarded orphan designation for adeno-associated viral vector serotype 9 containing the human glucocerebrosidase gene (Gene Therapy) as a new potential treatment for Gaucher disease from the European Medicines Agency (EMA). This first step allows us to start the process of achieving regulatory clearance for a potential clinical study into gene therapy. Over the last six months, a small project team consisting of members of the Association, researchers Dr Ahad Rahim and Dr Simon Waddington and their team at University College London (UCL) and Elin haf Davies as an independent Consultant have been working behind the scenes to explore and move forward with the numerous complexities involved in such a project. In a commitment to keeping our members up to date, a session was held at the nGD family conference on Sunday 15th November where our nGD patients and families listened to an update on the clinical work and were able to ask the researchers questions. The first step to Gene Therapy for Gaucher Disease ……. The UK Gauchers Association is delighted to announce that on 12 February 2015 the Committee for Orphan Medicinal Products (COMP) at the European Medicines Agency (EMA) granted a positive opinion for orphan designation (EMA/OD/303/14) to the Association (as the sponsor) for adeno-associated viral vector serotype 9 containing the human glucocerebrosidase gene (Gene Therapy) as a new potential treatment for Gaucher disease. The regulatory world in Europe can seem overwhelming, as it requires navigating between the National Competent Authority (NCA) in each Member State and the European Medicines Agency (EMA). To benefit from the EU Regulation on orphan medicinal products for rare diseases, it is necessary to follow a centralised procedure at the EMA. This allows for the designation of orphan medicinal products and puts in place incentives for the research, marketing and development of orphan medicinal products. Traditionally it has been considered that only pharmaceutical companies can engage in this procedure with the regulators, however this is actually open to individuals and academic / clinical institutions and patient groups. What is Gene Therapy, how does it work and what does it mean potentially for Patients with Gaucher Disease? Nearly every cell in our body contains a nucleus, each containing an entire, identical blueprint of our entire body. This blueprint is encoded into long strings of DNA which are bundled up tightly into chromosomes, so that they fit in the nucleus. The DNA code is subdivided into genes – each containing the code for an individual protein. Every cell contains the same number of genes (about 24,000) but actually contains duplicate copies of each gene – one from our father, and one from our mother. When we inherit these genes, sometimes from our parents, sometimes the gene copying process introduces an error (a “mutation”) which is so serious that the gene now codes for a protein that can’t function. In many cases this is ok – the copy from our other parent allows us to make sufficient amounts of that protein. However, sometimes if we inherit broken copies from both parents, no functional protein can be made. This is what happens with neuronopathic Gaucher Disease; the patient has inherited two broken copies of the gene encoding Glucocerebrosidase. The most elegant solution would be to repair the mutation in one or even both copies in every cell in the body. The technology to achieve such efficiency is still in its infancy. However it may be sufficient if we are able to deliver working copies of the genes to a proportion of the right cells. The state of the art tools with which we can achieve this are the basis of a whole field of technology known as gene therapy – delivering genetic material to cure diseases. Nature has provided us with an excellent vehicle to deliver genetic material – the virus. It has been possible to take viruses which infect humans but do no harm, and create synthetic versions (known as “vectors”) which are designed only to deliver working copies of genes. We have been working to develop a gene therapy treatment for neuronopathic Gaucher Disease. To do this, we have been using a mouse model of this disease, created by Professor Stefan Karlsson in Sweden; affected mice perish before 15 days of age. We injected a vector, known as AAV9, to deliver working copies of the human glucocerebrosidase gene to neurons in the brain of these mice on their day of birth. Most of the treated mice lived more than ten times longer than expected, and were healthy enough to breed. Given the encouraging results with mice, we are now looking at how this treatment might be given to babies diagnosed with this disease. A session will be held at the nGD family conference on Sunday 15th November to update patients and families on this exciting development, the session will enable families to meet with the researchers and ask questions. We will keep you updated on our progress as we take each step forward on this long and exciting road by posting updates on our website and Facebook page and in future editions of Gauchers News. Enzyme Replacement Therapy (ERT) has revolutionised the treatment of patients with Type I Gaucher disease (GD) however Types II and III that affect the brain remain a significant challenge with conventional medicine offering no route to therapy. There is clearly an overwhelming need to develop a treatment. Drs. Simon Waddington and Ahad Rahim of University College London (UCL) have been developing gene therapy to treat a mouse model that mimics the devastating brain pathology associated to aggressive Type II GD. They have been using viruses that are genetically engineered to remove the ‘bad bits’, rendering them safe, and replacing them with a fully functional and therapeutic glucocerebrosidase (GBA) gene. These viral vectors were injected into the brains of pre-natal or new-born mice where they deliver the therapeutic GBA gene into the cells. A significant increase in the lifespan of the mice was observed together with an amelioration of brain pathology and subsequent improvements in behavioural studies and biochemical markers. This is highly encouraging given the severity of the mouse model – one of the most challenging among neurodegenerative lysosomal storage disorders – and the study is now being prepared for publication. Is this minimally invasive route of administration as effective in extending the lifespan of these mice and is the brain rescued from the lethal neurodegeneration? Intriguingly, given the systemic nature of delivery, does this also address the visceral symptoms? The PhD studentship was awarded to Miss Giulia Massaro, who recently joined Dr. Rahim’s laboratory and will be working in close collaboration with Dr. Waddington’s group. Giulia began her scientific training in neuroscience as an undergraduate at the University of Padova and postgraduate studies at the University of Trieste where she studied neurodegenerative disorders. The ascendency of gene therapy over recent years means that this studentship is a timely opportunity to develop this technology further for potential application for GD.